The Spring Midwest Willys Reunion was held in our home town and we were asked to give a presentation on the history of the hydraulic lifts available for the early civilian jeeps. The weather didn’t really cooperate, but we did have a nice group willing to stand in the rain to hear what we had to say. Below is a summation of what we shared. A hydraulic farm implement lift or 3-point hitch as it is commonly referred to, was available almost from the beginning of CJ production, until the early 1960s. We are going to look at the development of the three earliest “Jeep Approved” lifts and touch briefly on the fourth and final Stratton Lift. By “Jeep Approved” we mean those lifts that came from the factory, the dealer or manufacturer and appeared in Jeep ads. There are many other lifts developed during this period, but we will not address them here. We are drawing on the work of Clint Dixon, who has and is doing extensive research on both Newgren and Monroe lifts. Clint owns a Monroe lift and uses Newgren plows, but doesn’t own a jeep. Monroe produced a lift for the Dodge Power Wagon, which is what Clint drives. For Clint to discover anything about his lifts and plows he had to go through the history of the farm jeep and we are the beneficiaries of all that work. Our second special resource is Jerry Wittkop of Monroe Michigan who also doesn’t own a jeep. Jerry is a retired engineer from Monroe Auto Equipment Company and is the curator of a display in the Monroe County Historical Society Museum. When Jerry joined Monroe as a newly graduated engineer in the late 1940s, his first assignment was to work on the new Monroe jeep lift. If you are a Monroe lift fan, you owe it to yourself to see Jerry’s display and you may even get a chance to visit with him. To understand the history of the jeep lifts, we need to go back before the jeep was even on the drawing board. J B Love was a young engineer from Michigan who in the mid-1930s saw a need for a new type of farm vehicle. He had observed the fruit farmers of the area gathering their crops from the fields, transporting them to the barn and then loading them onto trucks for the trip to the market. To solve this problem Love made a tractor out of a model ‘B’ Ford motor and truck transmission, with a truck rear-end, and called it a ‘TRUCTOR.’ The farmer could go from field to market traveling on the roads at about 40 miles an hour. Mr. Love made these Tructors from 1933-1936. In 1939, Love saw a demo of the Ford-Ferguson system and immediately purchased a Ford dealership. Love saw the 3-point hitch as the future of farming. Based on customer demand, he developed his own line of 3 point implements. The next we hear of Mr. Love, he is working as a consultant to Willys during the war as a designer of the post-war jeep. 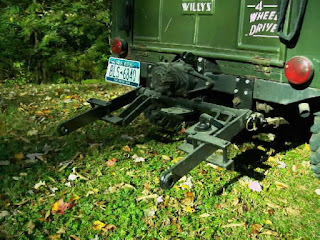 Willys was looking at a combination truck and tractor design for the civilian jeep and since Love had built the “Tructor” we can only assume that is how the connection is made. While we do not know the number of original Love Lifts that were produced, we do know that Newgren quickly made modifications to the hitch, even as they sold the lifts as the Love Hydraulic Lift System. 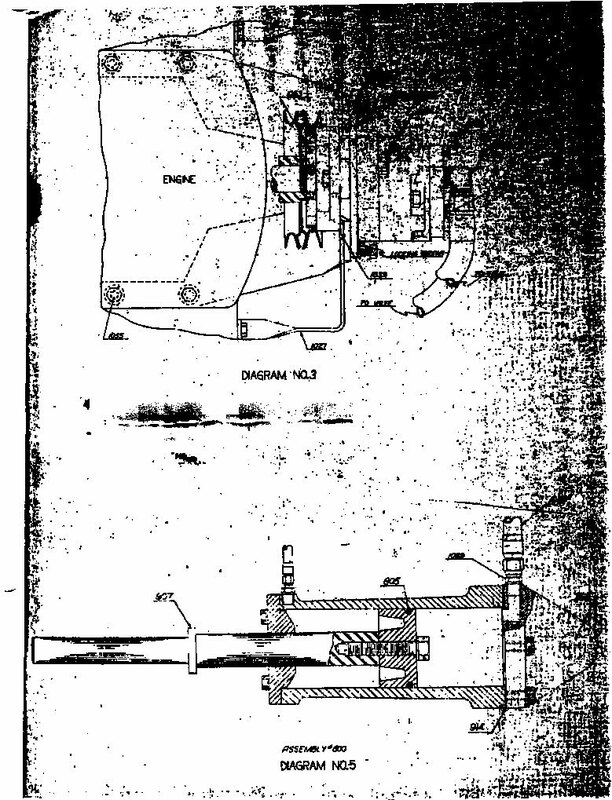 Pictures from a 1947 Popular Science article clearly shows the familiar Newgren hitch design and the Love hydraulic pump arrangement. Newgren then moved from the dash control and belt driven pump to the between the seats control and the crankshaft driven pump probably in 1947. Meanwhile Monroe was looking at its own design for a lift. The family owned company had provided a number of products toward the war effort, especially in aircraft. They had used their expertise in hydraulic systems and expanded their knowledge of manufacturing components in the development of landing gear and bomb bay door systems for heavy bombers. Like many companies they were looking at how to turn their war-time expertise into new products. Examples of those products are on display at Jerry’s exhibit and range from golf balls (molding technologies) to the Jeep lift. Monroe was a major supplier to Willys before the war and had a strong relationship with the company that was located just down the road. The Monroe engineers took a fresh look at the lift design for the jeep and were testing the system with Ferguson equipment by the summer of 1947. The patent for the system was awarded in 1948. Testing showed that the Monroe system performed better with Ferguson and other 3-point implements when compared to the Newgren Lift and Willys seems to have agreed. Monroe purchased Newgren in late 1947 with the idea of gaining a supplier who had both established manufacturing contacts for implements and an already established distribution network. In 1948, Monroe sold Newgren to American Bantam Car Company and moved Newgren’s operation to Butler, PA. To understand why this sell was made, we need to go back to the Ford-Ferguson story. 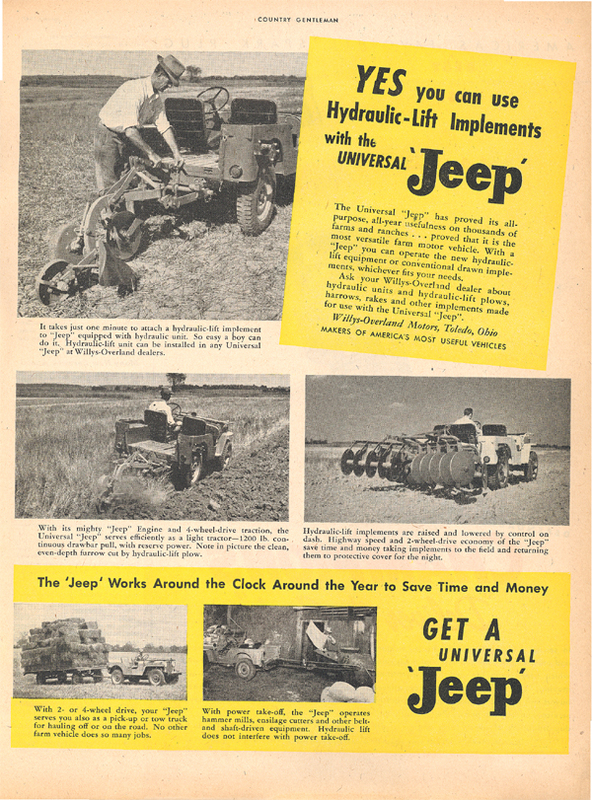 Ferguson started selling his own implements and at one time had a distributorship arrangement with Willys to sell plows through Jeep dealerships. Meanwhile following the war, Henry Ford II decided Ford should be making implements for Ford tractors and started the Dearborn Implement Company. Ferguson began to see Jeep as another competitor and was moving to stop the arrangement with Willys. Newgren was to develop a complete line of implements to use with the Monroe Lift. They did for a short period produce a wide range of 3-point implements. But by 1950, Newgren as a company had all but disappeared. Here the story becomes murky. 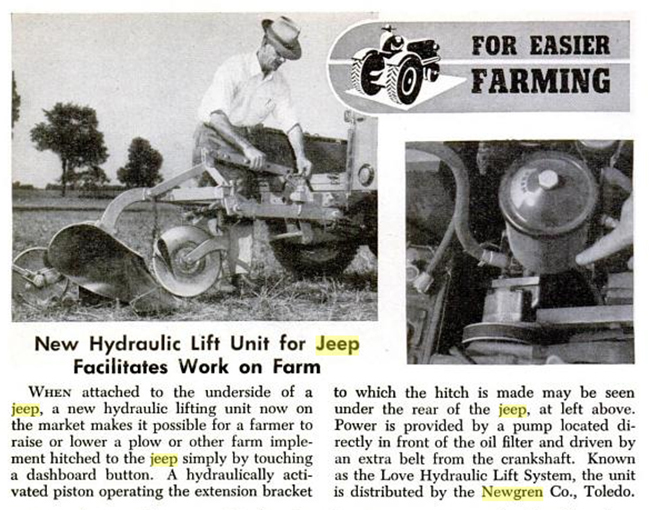 We do know that Newgren style plows show up in Jeep ads for the new CJ5 in the mid-1950s. Monroe Lifts were available until we believe around 1956. 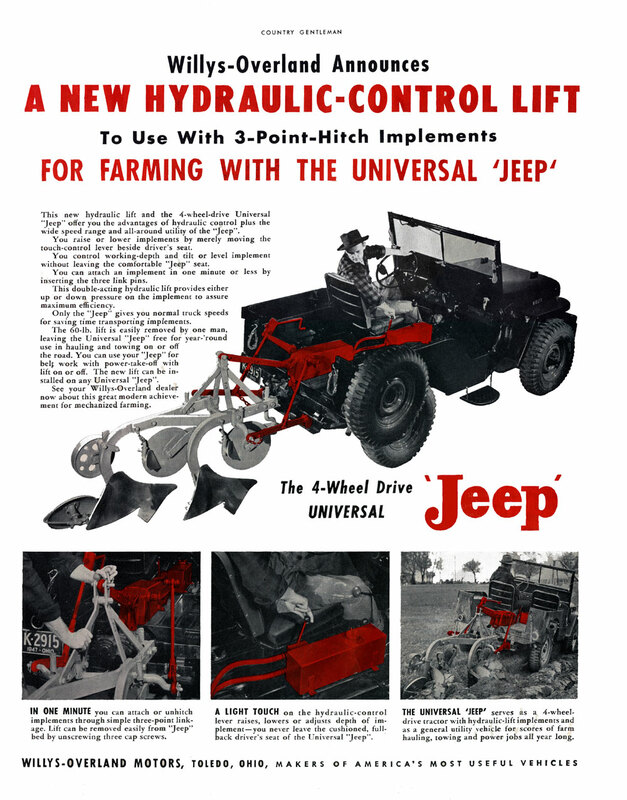 We are still researching this period, but we do know the fourth and final “Jeep Approved” lift appeared in the early 1960s. The Stratton Equipment Company of Cleveland, OH filed for a patent in 1960 and was awarded a patent in 1963 for a new type of lift. This lift combined the best of the Newgren and Monroe lifts. The Startton Lift fits under the bed, a major advantage over the Monroe, while providing improved 3-point geometry. We have little history of the Stratton Company other than they developed hydraulic systems used in the refuse hauling and material handlers from the 1940s. There are pictures of their equipment if you do a Google search. We have just received an ad from Clint showing a Stratton tailgate lift “Jeep Approved” for the Jeep FC truck. So clearly a relationship existed between the companies. The question remains as to who provided the lift design? Did Jeep go to Stratton and ask for an under-bed design that restored a popular selling feature of the Love and Newgren lifts? Or did Stratton go to Jeep with a design after they had established a relationship? 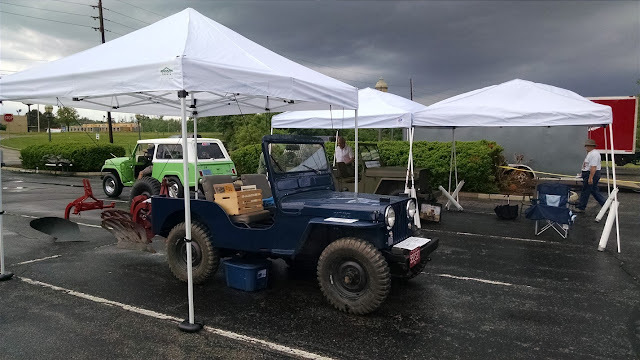 After the CJ5 redesign in the early 1970s that saw the gas tank moved and gear ratios changed, the era of the farm jeep was pretty much over. We have met a farmer who had custom gas tanks made for his new CJ5 so he could use the old PTO and Stratton lifts. The amazing part of this story is that with the exception of the late-comer Stratton, the entire development cycle for the jeep lifts in three short years from 1945 to 1948. Assuming Love was working on a lift as early as 1943 or 1944, it is still a very short time. We continue are research with Clint. Jerry and others, looking for production numbers for all the lifts. We would greatly appreciate any information you might have on this part of farming history. 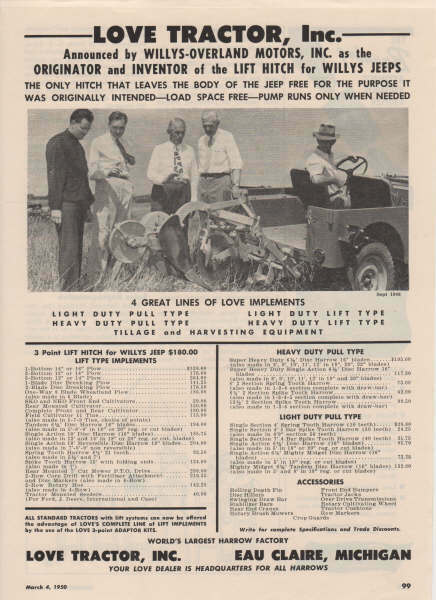 While researching the J B Love story, we found an ad right here on Farm Jeep that would indicate that Love was still selling his lift in 1950. Who knew? Apparently we did, but hadn’t realized what that meant. We plan to keep learning and hopefully add to and even correct our reporting of the history of the lifts. We always welcome new information. very nice post. it is very informative post. Thank you for the sharing this one. keep more like this. Previous PostPrevious A Jeep By Any Other Name…. And A New Jeep Pup!